During my trip to Croatia last month, we spent our time in Istria and Zagreb, and not along the famed coastal areas in Split or Dubrovnik. Rather than seafood, the mainstays of the meals were basic meats, frequently pork, and potatoes with heavy Italian influences of pasta. 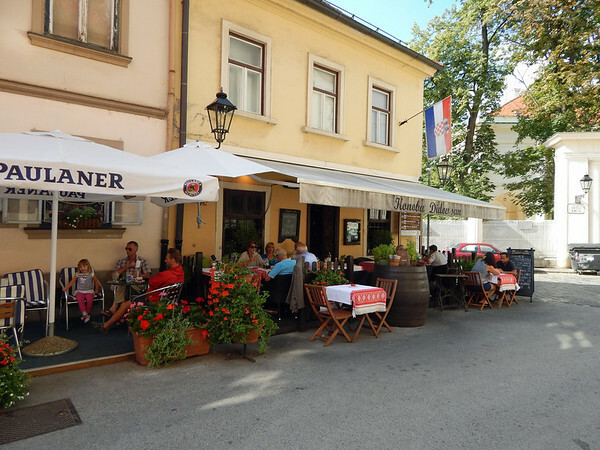 Our first day in Zagreb, we ran into the Didov San Tavern (Grandfather’s Dream) in Upper Town, and managed to nab a lovely table on the sidewalk. The place was recommended by employees at the Museum of Broken Relationships. It was the perfect place for a beautiful fall afternoon, and did not disappoint. (I noticed that it received a 2013 Certificate of Excellence from TripAdvisor). We tucked into the fritters and kajmah (aka donuts and soft cheese) a soft, somewhat salty cheese that was perfect with the crisp fried fritter. Another place we had dinner was at a restaurant called Vinodol, also found by just wandering by This place was definitely more modern than rustic compared to the other places we had been, but the food was similar: heavy on pork and hearty dishes, potato-and-pasta-driven, and huge portions. 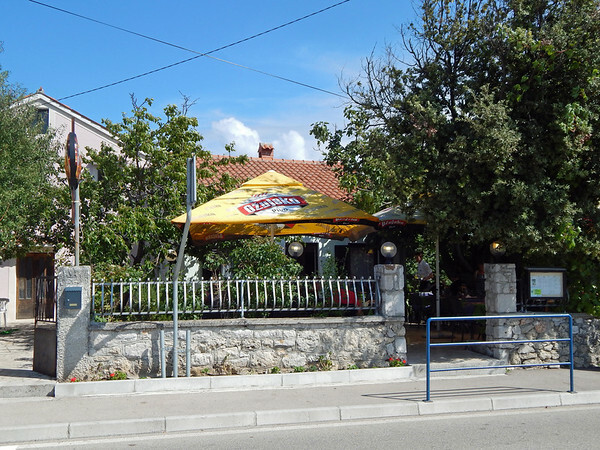 The meat-and-potato eaters will love the restaurants in Croatia, but I normally found them a bit heavy for my tastes. Everything smelled wonderful, and when I spied on dishes that nearby patrons ordered, saw that they looked beautiful as well. 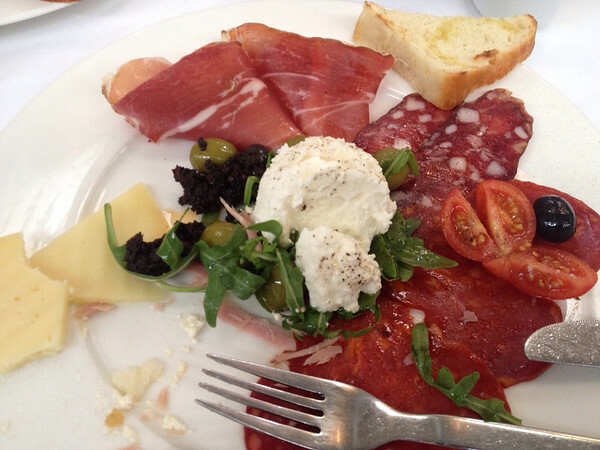 However, I located a nice plate of cheese and local ham and salamis, which complemented the lovely bottle of a local white wine, cool and crisp. That, and the required cup of coffee with little biscuits, made a satisfying end to our last night in town. The courtyard was lovely, and cool on this September afternoon. We sat beneath an enormous old fig tree. The waiter was great. When he found out I was from Texas, he told us how he and his friends would wear little star badges and pretend to be “Walker, Texas Ranger” and practice karate chops on each other. Guests at another table asked if we were lost. Since they were cooking the pork right out front, of course that is what we ordered, accompanied by an appetizer of local cheese and olives, wine, and the ripe figs that dropped on our heads. 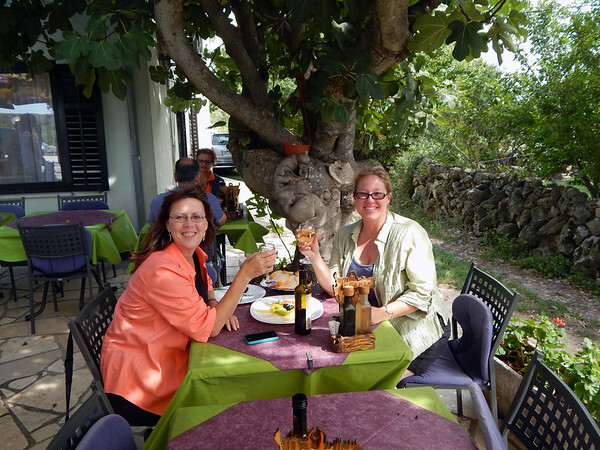 Cheers from two happy travelers, under the giant fig. If you aren’t willing to make quick decisions, and keep your plans flexible, you’ll miss opportunities like this. It’s also important to travel with friends who have a similar level of spontaneity and adventure. Of those, my wine glass overrunneth. Go ahead. Order the pig! Nice article! I’ve been living in Croatia for the last 10 years. And from what I can see, Croatians are not big pork eaters (except in East Croatian region of Slavonia). 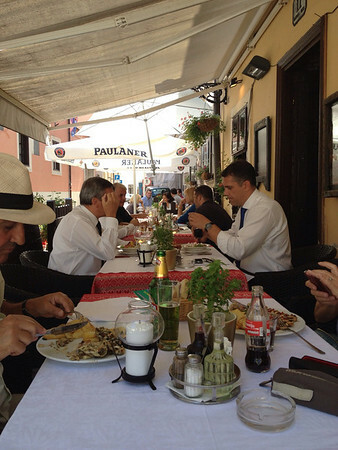 Croatians eat rather veal, polutry and some beef. 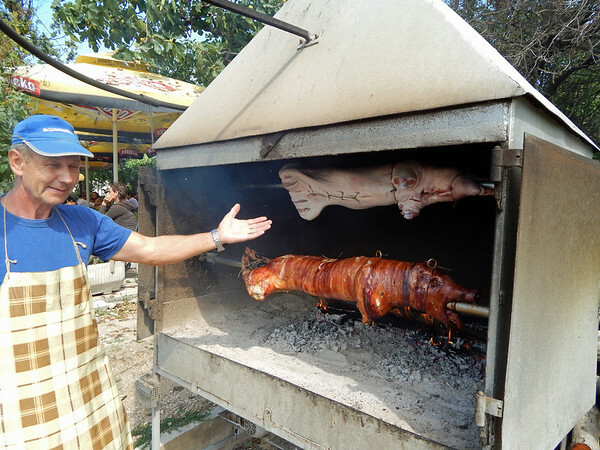 Restaurants roasting pork, especially along the coast, are mostly intended to tourists. There are lots of German tourists here and they love pork. We did see a lot of Austrians! 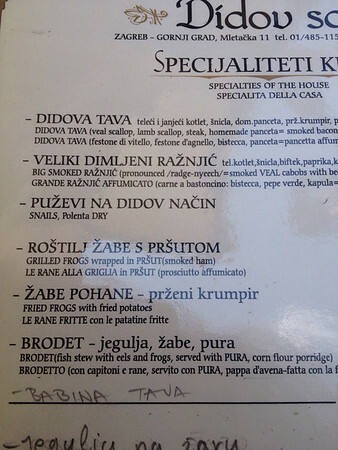 I have found the more north you are in Croatia (or north east) the more heavy meats they eat. 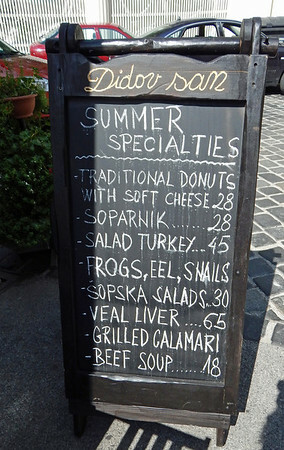 I definitely ate a lot of pork in Zagreb! and sauerkraut come to think of it! must be because of the close relation to Germany? Don’t know about all those frogs, but the pork looks amazing. 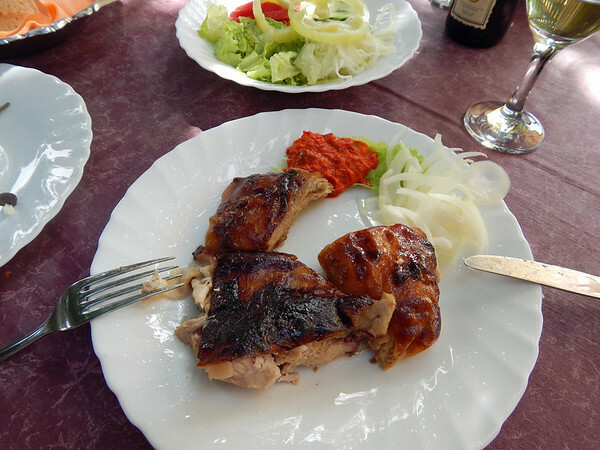 I recently met some travellers who had been in Croatia who enjoyed the food but found it a bit lacking in variety – I’m not seeing that in this post! It was heavy, and had less zip than I like. Maybe hearty? I did not try the frogs!